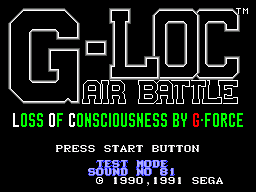 G-LOC - Air Battle (Loss Of Consciousness by G-Force) / G-Loc - Cheats - SMS Power! On the title screen, press on controller 2. This shows a sound test and enables test mode - during gameplay, press on controller 2 to complete the level and on controller 2 to change the terrain.